Song Lyrics: How was the solar system built? Looking at the planets of the solar system, you could be forgiven for thinking that if they do belong to the same family, it is by adoption rather than kinship. Not so: the story of the solar system's birth reveals that they are blood siblings, all created from the same molecular cloud whose collapse formed the sun. You might also think that these disparate bodies are scattered across the solar system without rhyme or reason. But move any piece of the solar system today, or try to add anything more, and the whole construction would be thrown fatally out of kilter. So how exactly did this delicate architecture come to be? When our sun formed, it swallowed about 99.8 per cent of the debris cloud around it. 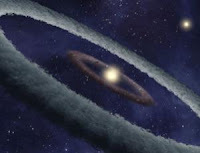 According to the generally favoured picture, the lean pickings that remained were sculpted by gravity into a thin disc of gas and dust encircling the newborn star's midriff (see illustration). As the dust grains of this disc orbited the sun, they collided and progressively coagulated into ever larger bodies. In the disc's innermost region, the ignition and burning of hydrogen in the sun made things very hot, so that only metals and silicate minerals with high melting points were present in solid form. Bodies in that region could only reach a certain size - producing the four small rocky planets of the inner solar system: Mercury, Venus, Earth and Mars. No such stringent limitations existed further out, beyond the "ice line" where methane and water are also present as solids. Here, the developing planets could grow bigger, and become large enough to start accreting gas molecules - mainly hydrogen - before energy from the sun's increasing glare ripped those molecules apart. That, ultimately, was how the gas giants Jupiter and Saturn came to be and, further out in still colder climes, the ice giants Uranus and Neptune. That is the reason astronomers expect these planets too to possess rocky hearts beneath their fluid coats. So far, so straightforward. But when it comes to certain details, the accretion model becomes rather hand-wavy, says Alessandro Morbidelli of the Côte d'Azur Observatory in Nice, France. For a start, no one really knows exactly how metre-sized boulders coalesced into bodies tens of kilometres across. Solid objects that small would have been buffetted around by the pressure of the gas surrounding them and sent spiralling into the sun before they could ever get together. A promising idea recently proposed is that local patches of turbulence in the gas provided vortices of lower pressure in which the boulders could collect and coagulate. A similar problem bedevils the gas giants, whose solid cores must have coalesced in the presence of gas they would later accrete. The risk of such planets being bounced towards the sun is illustrated by the "hot Jupiters" seen in other planetary systems. These are planets roughly the size of Jupiter but orbiting around their stars at the distance of Earth or closer (see "Is the solar system unique?"). Had anything like that happened in the early years of our solar system, the Earth and other inner planets could well have been slingshotted out of the solar system altogether - although that's no certain conclusion. According to Phil Armitage of the University of Colorado in Boulder, there's not much sign of any such drama in our neighbourhood. If evidence such as our overlarge moon is any indication, the inner solar system did remain a choppy place for its first 100 million years as the rocky planets consolidated (see "Why are the sun and moon the same size in the sky? "), but it soon settled down. And according to a theory developed by Morbidelli and colleagues, there was a rearrangement and expansion of the outer solar system a few hundred million years after the sun was born, when a particular conjunction of the orbits of Jupiter and Saturn gave a gravitational shove that propelled Uranus and Neptune out to the distant orbits they occupy today. Some of the small bodies that scattered on the way fell back towards Jupiter, whose immense gravity may have ejected some of them from the solar system. Deep in space, these unaccreted fragments collected as the hypothetical Oort cloud ("Where do comets come from?"). The knock-on effect of this last gravitational twitch of the solar system may have been a disturbance in the asteroid belt between Jupiter and Mars, creating the Late Heavy Bombardment that showered Earth with meteorites some 4 billion years ago, 500 to 600 million years after the sun formed. Since then, however, the objects that constitute our solar system have settled into a tranquil, if sensitive, balance - to our own inestimable advantage.